DeaFestival '97 was a thunderous success! 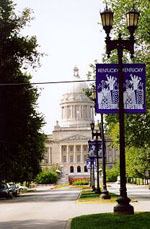 Over 4,500 individuals took over the State Capital Grounds in Frankfort, Kentucky. "I can't believe this festival is in my home state of Kentucky!" 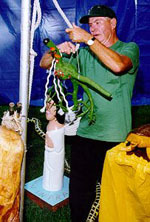 "I look forward to this festival every year," W.W.
"Children of all ages can enjoy!" "I enjoy the kids and making everyone feel good." KCDHH Staff knows how to enjoy DeaFestival!